Mardi Gras is just around the corner, and one of the biggest traditions of the annual celebration is eating a King Cake with family and friends on “Fat Tuesday," the last day of the Carnival season, which falls on March 5 in 2019. Fortunately, you don't have to live close to New Orleans or even in Louisiana to enjoy these famous cakes as there are plenty of places in the Dallas-Fort Worth metro area where you can buy a delicious King Cake and celebrate like you're on Bourbon Street. If you're planning to pick up a King Cake from a specialty bakery in the Metroplex, it's a good idea to call ahead and reserve one—especially if you're looking for one close to Fat Tuesday. Most bakeries say they do a lot of business on these peak days, so place an order so you can make sure you'll be celebrating in style this year. First opened in 1934, Blue Bonnet Bakery is a Fort Worth staple, serving generations of Texans quality, handmade products including delicious King Cakes during the Carnival season. Their traditional King Cake features raisins, apples, and pecans, but you'll need to place an order in advance of Mardi Gras if you hope to pick up your cake on Monday or Fat Tuesday. Blue Bonnet Bakery also has a selection of sweet and savory breakfast and lunch items and is open Mondays through Fridays from 7 a.m. to 6 p.m. and on Saturdays from 7 a.m. to 4 p.m. Additionally, while your purchases entirely go to benefit this family-owned company, the Blue Bonnet Bakery donates all of the baked goods that aren't sold each day to the First Street Methodist Mission, an organization that helps feed the homeless in DFW. Serving the Dallas-Fort Worth community for over 75 years, Casa Linda Bakery recently expanded from their original location in Garland to a new branch in Frisco that also serves breakfast and lunch. During the Mardi Gras season, you can also find cinnamon versions of King Cakes, which are available on a first-come, first served basis. Be sure to call ahead to make sure they have them in stock. Casa Linda Bakery is an amazing place and their King Cakes are sure to sell out quickly, but they also have plenty of delicious things to choose from, including iced Clown Cookies, bars, cupcakes, and other sweet treats. With locations in Uptown, Park Cities, NorthPark Center, and Plano, Bread Winners Cafe is an excellent choice for ordering a King Cake within 24 hours in advance of Fat Tuesday. Bread Winners Cafe also has iced sugar cookies and cupcakes decorated in the festive mardi gras colors for the occasion, which are typically available in the shop (no need to order in advance). Bread Winners Cafe is open for brunch and dinner on Saturdays and Sundays, and for breakfast, lunch, and dinner on Mondays through Fridays. You can also stop by Monday through Friday for their specials of the days, which include grilled cheese and tomato soup; house meatloaf; bucatini bolognese; fried chicken thighs; and fish 'n chips. Available as early as mid-January in plain or strawberry flavors, Kroger's King Cakes are some of the best in the area—and some of the most readily available, too. It's never too early for a King Cake at this national chain grocery store, which has locations throughout the Dallas-Fort Worth area. However, you should place an order in advance if you want to ensure you have a King Cake on Mardi Gras as many other people rely on Kroger's bakery for cheap cakes for special occasions throughout the year. Located in Van Alstyne, Texas, this home-operated specialty bakery is available for made-to-order King Cakes throughout the Mardi Gras and Carnival seasons. Ember's Cakes can be ordered online by e-mail or by phone, and all confections are handmade by Ember Pruitt, a long-time resident of the DFW area. Make sure to place your order at least a week in advance to ensure Ember has enough time to finish your King Cake before Fat Tuesday. Another great place to get cakes year-round, Central Market, will offer King Cakes in cream cheese, almond, and traditional flavors this year. With locations throughout the Dallas-Fort Worth metroplex, Central Market is a great destination for a last-minute King Cake, as these Mardi Gras treats are typically well-stocked throughout the Carnival season. Traditional King Cakes will be available at Market Street locations throughout the DFW region starting on the first Sunday in February, and you can also place an order in person or on the phone if you want to guarantee availability on Fat Tuesday. Since Market Street is a popular grocery and baked goods store, you should head there early on Monday morning if you haven't placed an advanced order for a cake. While there will surely be plenty of Mardi Gras-themed confections available throughout Carnival week, King Cakes will likely sell out quickly at most locations. Another popular place to pick up prepared foods, Tom Thumb offers King Cakes in traditional, raspberry, apple, and cream cheese varieties. Tom Thumb's traditional King Cake has an almond flavor to it and it's served with three beads and a baby. You can also add some decaf hazelnut coffee to your order or a variety of other delectable treats decorated in typical Mardi Gras colors of green, purple, and gold. For an organic King Cake, you can stop by the bakery inside any of Dallas' many Whole Foods Markets. King Cakes will be available in traditional cinnamon, raspberry cream cheese, chocolate, praline, regular cream cheese, and berry chantilly. 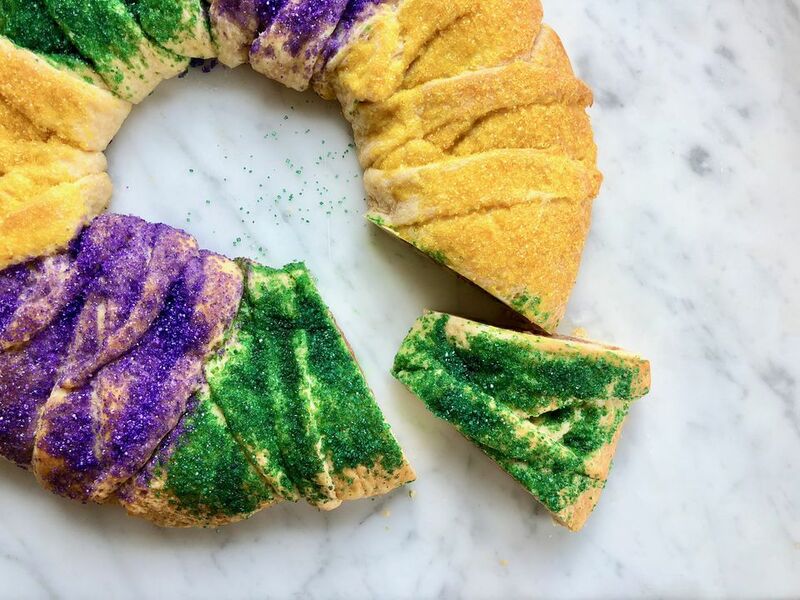 While a limited variety of King Cakes will be available throughout Mardi Gras week, you should place your order at the Whole Foods Bakery at least a week before the event to ensure you have a King Cake to take home to your family on Fat Tuesday.